Grow the sport of cycling by developing the next generation of serious cyclists. Train junior cyclists with a focus on principles and values; good sportsmanship, attitude and teamwork. Promote a lifestyle of fitness and exercise to build a healthy environment for families. When we started our program in 2003, we did not focus on trying to recruit the best athletes. We wanted to include as many cyclists as possible for improvement and success. 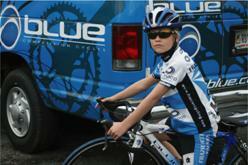 Unlike other junior development programs and cycling organizations we do not target only the gifted cyclist. We look for candidates who have a good attitude and an interest in cycling. 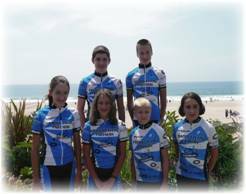 Our expertise is in developing kids with those characteristics into competent and lifelong cyclists�some who have become national champions. 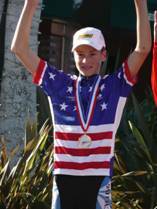 Frazier Cycling Juniors have won nine junior road national championship titles and 81 junior road national medals. We believe our junior development program is unique in several ways. Our program is based on a team structure. Many cycling groups who ride together call themselves teams but they but may not function or race as a team. Our coaching and training are focused on the �true� team approach. We also recognize that junior cyclists are not little adults and need to �have fun with their teammates� or else they will lose interest in a sport that is very demanding. Parent participation is a key to our program. We encourage parents to practice and ride with their children. It keeps them fit and gives both parent and child an opportunity to share in a healthful activity. Our program is year round. Year round training is especially important for people who compete and/or participate in endurance sports such as cycling, running, and swimming. It is crucial that these people maintain and/or improve their fitness and their technique throughout the year; otherwise, they will find themselves trying to catch up. During the competitive part of the season, our program concentrates on training that is specific to racing. During the "off-season", our program offers broader training elements with diversity that includes activities, skills, and exercises that promote long term cycling development. In addition, the diversity of our "off-season" helps our members avoid burn-out such that they can continue training with enthusiasm and interest. Another very important aspect of our year round program is that it keeps our team together, which increases their team bond, team spirit, and team loyalty. These elements are crucial to the continued success of our team and team members. To summarize, our program takes into account the physical, psychological, physiological, and emotional needs of young cyclists as well as social considerations and gender differences. We have kept detailed statistics on our team as the members move from young juniors to teens. Frazier Cycling determines whether or not the cyclist is appropriately meeting the cyclist's designated Program Level based on attendance, commitment, and skills competency. Based on this evaluation, the cyclist's Program Level may be changed. All Competitive Program membership levels are included on our race team. Additionally, there is no explicit or implicit hierarchy regardless of Program Level membership with the exception of the Honors Program, which requires team leadership. The program is not recreational cycling; our race team members are groomed to be serious, competitive cyclist. They are taught traffic safety and behavior, group riding and teamwork, race strategies and tactics, competency improvements, basic equipment information, and fun! Although the first race of the season is in February and the last is in October, the majority of races are from April to August with a focus on the USA Cycling Junior Road Race National Championships. During in-season training (March � October), the concentration of the fitness program is by means of cycling and running. During the off-season (November - February), the program focuses on strength conditioning with the addition of Plyometrics, sit-ups, push-ups, standing broad jump, medicine ball throws, wheelbarrow races, and resistance bands. Training is year-round. In the off-season, only Wednesday 6:30 practice moves indoors. All other practices are outdoors throughout the year. All Competitive Program Members must abide by Frazier Cycling's Race Team Rules. Equipment required for all programs: Helmet, road bike, cycling shoes, clip-less pedals, Frazier Cycling race kit (team jersey and shorts), sun glasses, cycling gloves, and water bottle. Trainers and blocks are needed for indoor workouts and race site warm-ups. 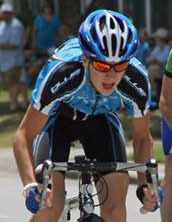 Member of Frazier Cycling Juniors Race Team and may participate in races and race-related activities. 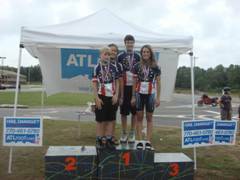 Opportunity to attend USA Cycling Junior Road National Championships. Primary Level is our entry level*. The Primary level is for beginners, multi-sport athletes, multi-activity athletes, and many remote team members. Primary Level Membership does not require attendance at races. All cyclists must be assessed for skill level through Basic Training sessions prior to participating in the Primary Program. Beginning juniors may require up to three Basic Training sessions. Members are eligible for up to three practices/rides per week (see practice/ride schedule chart). Members remain at the Primary Level unless they make cycling their principal year-round activity, they have the ability to attend rides and workouts, and they meet the competency requirements. Frazier Cycling will evaluate requests for approval to move cyclists from the Primary to Intermediate and/or Advanced Level. *Experienced junior cyclists may begin at the Intermediate level as long as they can meet the level's competency and attendance commitment. Intermediate Level is for juniors who enjoy competitive cycling as their principal year-round activity. The commitment to attending practices/rides and races is higher than the Primary Level. In particular, Intermediate Level Members are expected to attend nearly all races on our schedule. These members must obtain Frazier Cycling's approval if they are unable to attend any race on our schedule. Members are eligible for up to five practices per week. Advanced Level includes two sub-levels: Intermediate-Plus ("Plus" implies On-line Coaching) and Honors (includes On-line Coaching), which are described below. Intermediate-Plus Level Program adds Training Peaks and Power & Fitness Testing to the Intermediate Level. Frazier Cycling provides a Training Peaks account to each Intermediate-Plus Level Program Member. Practices/rides attendance requirements are fulfilled with file uploads corresponding to the workouts specified by Training Peaks calendar. A power meter is required. Testing and evaluation to identify physical strengths and weaknesses of the individual. A power meter is required for Honors Program Members. Frazier Cycling provides a Training Peaks account for each Honors Program Member. Within each account, the individual's personal settings including power levels are maintain by Frazier Cycling Coaches. The power levels are determined as a result of an individual's most recent power test. Each Honors Program member is responsible for using a power meter during workouts and uploading the resulting files to the Training Peaks website for analysis and tracking by Frazier Cycling coaches. Practices/rides attendance requirements are fulfilled with file uploads corresponding to the workouts specified by Training Peaks calendar. **Completion of the Chattanooga Ride can be substituted for the 30-minute Power Test, 3.2-mile ITT, or Career Club Mileage requirement. Our Honors Program Qualifications are reviewed annually by our coaches. These qualifications are dynamic. Based on the performance of the team members, the qualifications may change to reflect the abilities of the team. Indeed, over the past ten years, the 30-minute Power Test and 3.2-mile ITT qualifications have increased significantly since the original standards. Every season, each Honors Program Member and/or candidate and a guardian must sign the Honors Program Agreement. 1. Update TrainingPeaks Daily; notify your coach or ask a teammate for help if you are having technical issues. 2. Responsible for learning to set up and use your power meter computer. 3. Responsible for learning how use the power meter and Training Peaks software to analyze your own training data. a. 2 weeks notice - vacations and periods you will be unable to train at least two weeks in advance. b. 24 hours notice to a coach if you are unable to make a scheduled practice for any reason. c. If you are sick or injured contact one of the coaches immediately. 5. If you are unable to attend a race notify coaches at least two weeks in advance. 6. If you are having problems unrelated to training but that affect your ability to train (i.e. poor grades, school field trip, etc.) let one of the coaches know. 7. You must maintain a �B� average in school and/or college. 8. You must not change your scheduled training without permission from a coach. 9. You must wear Road ID at all times when on the bike. 10. You must conduct yourself as a role model for the Frazier Cycling Team at all times. *Frazier Cycling Management has the right to remove a member from the Honors Team/Program. Why do we mandate the use of power meters by our Honors Program members? "The ideal training program for any athlete is one that is challenging enough to result in continual improvement, but is not so taxing that it results in illness, injury, or overtraining. Achieving this delicate balance can be difficult in any sport. However, this is especially true in cycling because the resistance to forward motion varies markedly depending on altitude, weather, terrain, road or trail surface, and/or the effects of drafting. Consequently, current or even average speed is often a poor indicator of training intensity, which can make it difficult to regulate the overall training load..."
Heart rate training became widely accepted in the 1990's as a way to measure workout intensity. Experts identified various heart rate training zones for specific training intensities, such as recovery, aerobic, tempo, anaerobic threshold, lactate threshold, VO2 Max, etc. Unfortunately, heart rate can be influenced by a variety of factors such as altitude, ambient temperature, hypo-hydration/dehydration, infections, recent illness, and fatigue, Hence, heart rate is not wholly reliable for quantifying workout intensity. For our sport of cycling, these limitations have been avoided by using power meters to directly measure power. Intensity levels are determined by a testing procedure utilizing a power meter to capture data as the cyclist performs the test. From the analysis of the "power test" results an individual's power levels for the specific training intensities can be determined and these power levels can be applied to the individual's workouts and incorporated within a training plan to satisfy Dr. Coggan's statement. Indeed, that is our basis for requiring that all Honors Program members use a power meter during training and testing. Periodic power testing results will show progress and identify individual strengths and weakness for an individual. These results will allow our coaches to determine if adjustments should be made to individual workouts and training plans that will produce continual improvement. In particular, Frazier Cycling measures an individual's sprint power, anaerobic threshold power, and lactate threshold power, which are the key data points measured for national class junior cyclists. We compare our team members' results to their past results and juniors of the same age group and gender. We use these comparisons help us to make any necessary workout/training plan changes and to reestablish training objectives and performance goals. Coaching includes a training plan, weekly consultation, and Frazier Cycling Partners Team Membership. The plan includes personalized daily workouts including descriptions, durations, and intensities, with periodic testing. The athlete is expected to maintain daily logs (electronic, TrainingPeaks), which are analyzed by our coaches. Testing is conducted under the supervision of our coaches. Test Analysis includes an assessment with recommendations for performance improvements and any necessary training modifications. Full statistics for training, testing, and racing including time splits, mileage, speed, heart rate data, power, performance analysis, and progress charts are maintained. Three month minimum. All Frazier Cycling Juniors are required to have "Junior Gearing". "Blocking" cassette gears is not permitted on our team. By general USA Cycling Rule 1J6, juniors participating in road (road races, criteriums and time trials) are limited to a chaingear ratio of 7.93 meters (26 feet 0 inches). This means that with the chain in the bikes largest gear combination (biggest front ring and smallest possible rear cog), the bike cannot travel more than 26 feet with a single turn of the cranks. To guarantee compliance with Rule 1J6, we recommend that our junior's bicycles that have 700c wheels use a compact crank-set with a 50-tooth chain-ring as the largest front ring and a 14x25 cassette (smallest cog of 14 teeth) on the rear wheel. We recommend the use of a 50-tooth chain-ring rather than 52-tooth because most juniors, in particular U15, are unable to generate enough force and velocity (cadence) to achieve power with a 52x14 combination. For lighter riders riding downhill, the circumstance is more problematic. Speed (or velocity) equals distance divided by time. Note: Juniors are classified as race ages under 19. The link below contains a chart that compares junior maximum gearing (52/14 & 50/14 largest ring/smallest cog combinations) and cadence (RPM) for largest gears to achieve various speeds (MPH) with actual wheel circumferences using selected tires. Senior maximum gearing (often 53/11 largest ring/smallest cog combinations) is included in the chart, too. Also, included is USA Cycling's expected rollout lengths according to page 136 of the 2006 USA Cycling rulebook. Practices/Rides/Skills Sessions Offered Weekly � Locations, Times and Days are subject to change. Start times vary based on time of year. Attendance, availably, and skills competency determine placement in our Competitive Program (Primary, Intermediate, Advanced). Attendance is based on participation in rides and/or practices (races and special events are not included). The individual's commitment to attending cycling practice is evaluated according to our attendance criteria and it is reflected on the junior's annual Report Card. The score for "Attendance" is based on criteria that applies for each level. The grading scores range from a high 4 to low 1. Percent Attendance � Based on three practices/rides/races per week for Primary Program Members; five practices/rides/races per week for Intermediate Program Members; six practices/rides/races per week for Advanced; seven practices/rides/races per week for Honors Team. Frazier Cycling determines whether or not the cyclist is appropriately meeting the designated Program Level based on attendance, commitment, and skills competency. Based on this evaluation, the cyclist's Program Level may be changed. Skill/Fitness practices are coached sessions that afford the student the instruction necessary to handle the bicycle within group rides and/or races. Fitness is addressed with intervals, drills, and simulated races during these practice sessions. The practices appear on the weekly ride schedules. The locations for our current practice sessions are Cross Pointe Way (formally Distribution Drive) in Duluth, Bunten Park Athletic Building in Duluth, and Children's Healthcare Warehouse in Duluth. Race Team practices are coached sessions that give specific instructions for racing preparation, skills, strategy, and tactics, etc. Typically, Frazier Cycling has one of these sessions per week on Saturdays at 11:30 a.m. Check the weekly ride schedules for exact times and locations. Group training rides are our club rides that appear on the weekly ride schedules. Training rides include the Flowery Branch 50 (FB-50), Lunch-time 18 & 20 (LT-18, LT-20), Office Park 21 (OP-21) or �Laps�, Hill Repeats, Gary's 23-miler, etc. Eligibility for these rides is based on the student's Group designation. Juniors can receive the same coaching (training) program as our Frazier Cycling Juniors. The On-line Juniors Coaching Program includes a training calendar/schedule with personalized daily workouts including descriptions, durations, and intensities, with periodic testing. The athlete is expected to maintain daily logs (electronic) via Training Peaks, which are analyzed by our coaches (testing is conducted by the individual, i.e. self-test). Test Analysis includes an assessment with recommendations for performance improvements and any necessary training modifications. Statistics for training, testing, and racing include data such as mileage, speed, heart rate, power, performance analysis, and progress charts. A power meter (such as CycleOps PowerTap, SRM, Stages, SRAM Quarq, Garmin Vector, etc.) is required for juniors who are race age 13 and older (12+). Daily communications between the on-line junior and our coaches occurs through TrainingPeaks. We offer a 25% discount for the second sibling's Membership Fee applies to the lesser tuition fee amount. The third (and more) child's Membership is free. Coaching fees still apply for those receiving free Membership. Call for specific needs and more information including athlete goals, activities, and availability. 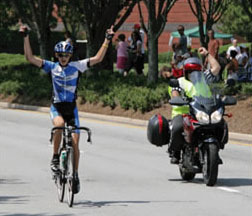 Youth cyclists must complete basic training before they can participate in any group training or practice. Basic training sessions are one-on-one training with one of our certified coaches to assess the rider�s skill level and bike fit. The number of basic training lessons needed to complete basic training is dependent upon the student�s skill level progress. Proper starting and stopping technique. Proper hand signaling and communication. Proper speed within a group. Instruction for pace-line movement, position, and etiquette. Understanding traffic, lanes, signs and signals, and traffic behavior. Pedal stroke, cadence, gear shifting, and hand positioning skill instruction. Program fee invoices are emailed quarterly at the beginning of each quarter. There is a three month minimum commitment for each program. We offer a 25% discount for the second sibling's Membership Fee. The third and more siblings' Memberships are free. On-line Coaching Program fees still apply for those receiving free Membership. Basic Training sessions are paid per session. Camps and clinics Prices are fixed per event. Only advertised discounts apply. No discounts or refunds for partial participation or withdrawals. Parent is responsible for any damage to bike - equipment and labor charges will be incurred by the renter. All Frazier Cycling Members and/or parents/guardians must read, sign, and submit our "Participant Agreement, Release and Assumption of Risk (The Agreement)". We provide road bike and cycling shoes rentals for Competitive Program members (only) based on availability and size requirements. The cost is $75/month. Bike rentals are for one month (exceptions are allowed based on demand). Rental fee is due when the bike is leased. Parent is responsible for any damage to bike - equipment and labor charges will be incurred by the parent. Parent participation is welcomed by Frazier Cycling for all of the Skill/Fitness practices and as race escorts (10-14 age group) without charge. If parents want to become more involved, then memberships are available as Frazier Cycling Partners. Frazier Cycling coaches assess each student's cycling abilities. These abilities are identified by skill grouping or skill sets. Cycling Skill Sets are divided into three progressive levels starting with Level 1. Level 1 Skills are the basic skills necessary for safe bike handling and group riding. Level 2 Skills are necessary for the participation in large group riding and they are the cornerstone for competitive cycling. Level 3 Skills are those skills that are needed for success in competition. 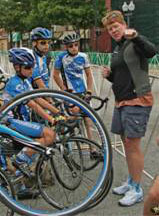 In addition to skill assessment, Frazier Cycling Coaches ascertain the student's cycling goals. The students are considered for placement into the appropriate level of Frazier Cycling Youth Program. The final decision for student placement is agreed to by the coaches, the student, and the parents.